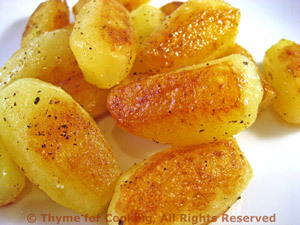 Turned Potatoes, Thyme for Cooking easy yet elegant gourmet side dish. These look trickier than they are: they take a bit of work and planning but make an impressive side dish for steaks or roasts. The carving and blanching can be done in advance, making it an elegant party dish as well. We'll start backwards: The finished product is potatoes that are barrel-shaped and app. 2 inches (5cm) long by 3/4 inch (2cm) thick at the middle (like a barrel, ends will be just a bit smaller). Look at your vegetables: Ideally you should be able to cut the potato in half the short way and have two pieces a bit longer than 2 inches (5cm). Cut these halves into 4ths the long way and, as they say, 'cut away the part that's not the barrel'. Trim the pieces into something close to a barrel-shape. A large potato will give you 8 turned potatoes and a small potato will give 4 - you won't cut it in half the short way first. You will want 6 - 8 per person. Don't be overly concerned about your carving abilities, just try to keep them similar in size. A little smaller is fine. Peel potatoes and put into a large bowl of cool water. Select a potato, cut and carve, keeping the pieces that you're not working on in the water. Bring a large pan of water to boil . Drop in the turned potatoes and boil for 5 minutes. Remove and drain well. They can be done several hours in advance up to this point. In a medium nonstick skillet heat the butter and oil over medium heat. Add the potatoes and brown well on all sides, about 15 minutes. Remove, sprinkle lightly with salt and serve.